I've noticed that most of my north Indian friends are not aware that rasam can be made with so many different ingredients - lemon rasam, dal rasam, pepper rasam, garlic rasam, tomato rasam, neem flower rasam etc etc. Each has its own predominant flavor. I like tomato rasam for its tanginess, that the tomatoes impart. Also for me rasam is a good time saver. It takes exactly 15 min to prepare from scratch. Its a good remedy for indigestion and cold. Grind pepper and jeera in a blender to a coarse powder. Add garlic cloves and green chillies and blend again. Mix this paste with the tamarind water and add turmeric, rasam powder and salt. Tomatoes can be roughly chopped and added to this tamarind water and crushed by hand or roughly ground along with the garlic and green chillies. Let this tamarind water rest for about 5 min. Heat oil in a pan and add the seasoning ingredients. When it turns light brown pour in the tamarind water mixture. After 5 min, taste it for salt and spice and add salt or pepper as necessary. If its too sour some more water can also be added. Switch off the heat when it starts to froth on the top and add chopped coriander leaves. 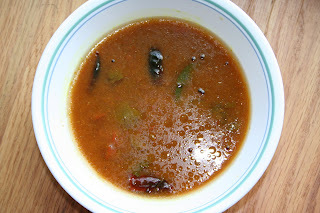 Rasam is ready to be served with rice or can be served as a soup. Fresh rasam always tastes better than refrigerated ones. Sorry SHN. I've heard abt vazhaipoo vadai back home but this is the first time I tasted it. It is worth the time spent cleaning it.